These are just a few of the blocks I won. The wonky strips in December? I wanted to use my own blocks that I had cut too small and mixed them with a few others. I still have the big quilt to put together. 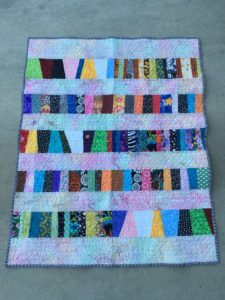 I love the mixx of strip widths–it adds even more randomness to the blocks. I am sure whatever baby that finds itself wrapped in this quilt will enjoy all the shapes and colors. Oh Julie, It’s LOVELY!!! and I can see 3 of my blocks in there!! Thanks for sharing!! !